Approximately 29,000 emergency room visits are made to UMass Memorial Children’s Medical Center and its affiliate hospitals each year, as well as over 32,000 visits to primary and subspecialty clinics. 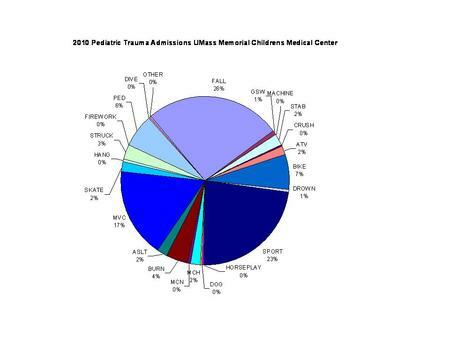 Utilizing hospital trauma registry data and state epidemiology statistics, the chapter has categorized the various reasons why children are admitted to UMass Memorial Children’s Medical Center. Injury Free Coalition for Kids of Worcester is an interdisciplinary team focusing on intervention programs to decrease the incidence of these traumas. The Worcester group has been part of the Coalition since 2001. Injury Free Coalition for Kids of Worcester is working with community leaders on the following projects: a bi-weekly car seat safety check; a playground safety improvement/renovation project; a gun buyback/violence prevention program called "Goods For Guns"; one of the nation's first injury prevention hands-on training courses for medical students; distributing “Safe at Home” home childproofing kits; teen driver education courses; and Mobile Safety Street, an interactive safety display aimed at educating children in pedestrian, home, and school bus safety. Watch this video as Dr. Hirsh encourages the Worcester District Medical Society to support the change to the enforcement of seatbelt laws from secondary to primary. There are currently no events listed for Worcester, MA.